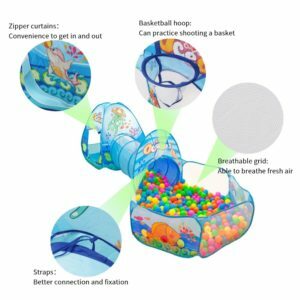 Sunba Youth Kids Tent with Tunnel, Ball Pit Play House for Boys Girls, Babies and Toddlers Indoor& Outdoor(Balls Not Included) is now available at Amazon.com for just $39.58 (REG $89.99) (As of 05 April 2019, 19:04 PST – Details) with $50.41 (56%) Savings. ❤ 3-in-1 Design: 60% OFF TODAY! 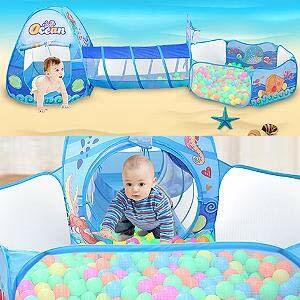 Sunba Youth Newest Ocean Theme 3Pcs play tent baby toys include a triangular tent, a tunnel tent and a ball pit. Each component can be used together or separately. We can provide children with a playhouse even at home. 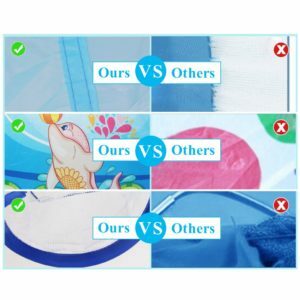 ❤ Eco-friendly material：Made of 100% double-sewed and washable polyester , high fabric resistant to wear & tear but breathable mesh and soft design , safe playground for the toddlers, give your kids the best protection and greatest happiness. 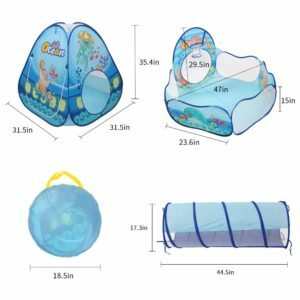 ❤ Portable kids toys: Easy to pop up and fold up, the play tent is suit for toddlers and kids indoor & outdoor playing. Comes with a lightweight zipper carrying bag for convenient storage. ❤ Multi-purpose purchase : No longer have to worry about choosing the gift. 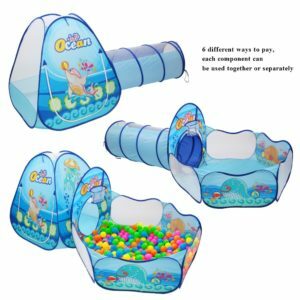 This toddler playhouse toys would be a perfect gift for Birthday, Christmas, or just a surprise to your kids , best toddler toys for parties, picnics, parks, carnivals or at home. ❤ Enjoy the Life with No Risk : 100% money back guarantee , We devote ourselves to provide the best customer service and bring the best shopping experience to every customer.Please feel free to contact us to get .Get the play tent and enjoy good time with you kids now! Sunba Youth pop up tent include a a triangular tent, a kids tunnel tent and a ball pit. Each component can be used together or separately. Combine all 3 pieces will have more play fun space, suitable for a few kids to play together. This can develop motor skills,practice color perception and differentiation. Let your kids grow up happily and healthy. 1.Age acquirement: 6 months and up. 2.Please don’t place heavy objects on the kids tent. 3.The play tent will quickly bounce open. Please expand the tent carefully when you open the package. Children should be used under adult supervision and guidance. 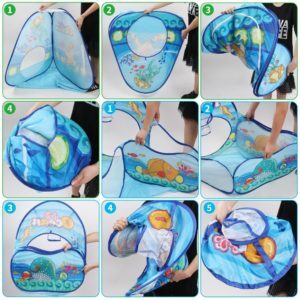 4.For healthy use, please clean the play tent regularly, just need wipe with the wet towel. Colored Ocean Balls can effective attract the attention of the baby, help exercise the baby’s perception of color. Baby always curious about the world. There are many ways to exercise their computing power in the process of play. 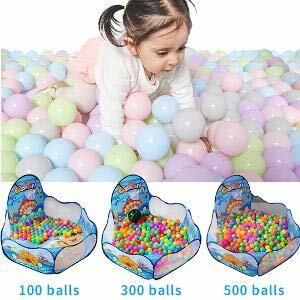 Our ball pits can even hold up to 1000 ocean balls. Sunba Youth pop up tent include a a triangular tent, a kids tunnel tent and a ball pit. Each component can be used together or separately. Combine all 3 pieces will have more play fun space, suitable for a few kids to play together. This can develop motor skills, practice color perception and differentiation. Let your kids grow up happily and healthy. Let your kid’s imagination run wild with this perfect 4pc adventure play tent set. They will occupy themselves for hours at a time jumping, crawling, playing hide-and-seek indoor or outdoor. Comes with a zippered storage bag let you carry it everywhere freely.